SALE: 25% Off All 2012 Tucker Hibbert Clothing! For a limited time, Tucker is offering 25% off all his 2012 clothing! Click HERE to shop and save. Everyone wants a piece of him: racers want to beat him, sponsors want to sign him and fans want to get close to him. Now everyone can get his ProCross F800 Race Replica snowmobile. Designed, signed and given the stamp of approval by #68 himself, Tucker Hibbert has introduced the gnarliest snowmobile bolted to white skis! The Tucker Hibbert Race Replica is a consumer version of the race-winning ProCross Sno Pro that carries Tucker to victory, equipped with competition-spec components like Kashima Coated FOX Float EVOL X ski shocks; white trail skis, number plates, a low custom race-cut windshield, handguards, an aggressive non-slip seat cover and exclusive race-inspired graphics. The race-version of the Slide-Action rear suspension has white powder coated rails, complete with FOX Zero X shocks featuring remote reservoirs and clicker adjustments. The platform for the Tucker Hibbert Race Replica’s superiority is the ultra-light and tough ProCross chassis, with the front Arctic Race Suspension offering the ultimate precision and steering control. With 10 inches of travel up front and 13.5 inches at the rear, Tucker’s Race Replica is tuned to blast bumps and withstand even the hardest landings. 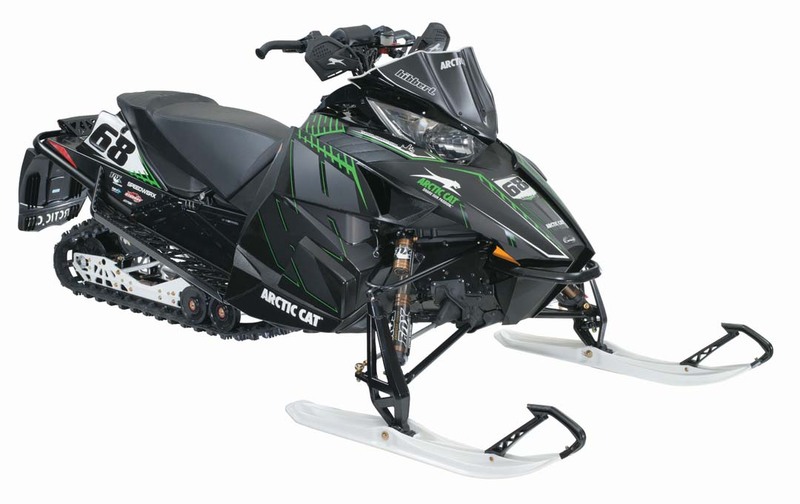 Powering this limited-edition snowmobile is the 160-plus hp 800 H.O. 2-stroke engine featuring batteryless EFI, electronic APV valves and Exhaust Pipe Temperature Sensor. With the Arctic Drive System and Torque Control Link putting all the power to the 15 x 128 x 1.25-in. Ripsaw track. It’s only available in Tucker’s signature color, black/black. Hang out with Tucker at Hay Days! Don’t miss your chance to hang out with Tucker at Hay Days Saturday, September 8 in North Branch, Minn. Throughout the day, he’ll be hanging out signing merchandise at his booth and signing posters at the Arctic Cat Factory Tent and FOX Shox display. For the first time, the Monster Energy/Arctic Cat semi is rolling to Hay Days. It’s loaded with with four of Tucker’s championship and Winter X Games trophy sleds. The semi and sleds will be on display both Saturday and Sunday in conjunction with the Arctic Cat Factory Tent. Make sure you’re at the Arctic Cat Factory Tent at 1 p.m. Saturday for the BIG “Want a Piece” announcement! 1:00-1:30 pm: “Want a Piece” Announcement!